Many neighbours attended the Safer Neighbourhoods Police Street Meet last Saturday where PC John Moody gave advice on any concerns. The main problems discussed from Saturday’s meeting were noise complaints from the Greenwich Hotel in Catherine Grove and the break-in of the gates to the Charter Buildings; Vehicles continuing to ignore the No Entry sign in Devonshire Drive; Fake researchers going door to door to try and gain access to homes (see previous ATA post) and an increase of the small gas cylinders, known as hippy crack or laughing gas, littering many of the roads around Greenwich in particular on the corner of Egerton Drive and Ashburnham Place. Some residents living nearby are being disturbed by people spilling out of the hotel late at night making noise, smoking and drinking outside after events. The police are working with the Council’s Noise team on this issue and anyone affected can contact the Noise Call out service on 020 8921 8921. Hours are extended on Friday and Saturday from 7 pm – 2 am in the summer. It is also worth keeping a diary sheet of times of any noise disturbance and how it has affected you personally e.g. ‘unable to sleep due to shouting and screaming’ etc. The Charter Buildings were previously targeted by two motorcyclists who forced the entrance gates open to try and steal mopeds. Motorcycle crime, the theft of pedal cycles and mopeds is a major concern throughout Greenwich. People are advised to be particularly vigilant and to report any suspicious activity to the police immediately. Drivers ignoring the no entry signs from Greenwich High Road into Devonshire Drive and speeding off has been an on-going issue over the years. Safer Neighbourhoods Police patrol this patch as best they can and try to get the traffic police to deal with it but any other enforcement measures are predominantly the responsibility of the Council. The police advise people to be firm in turning bogus/cold callers away on the doorstep. Residents need to be very wary of bogus callers who come across convincingly while trying to find out who is at home or away. Neighbourhood Watch signs and No Cold Caller stickers on doors can also be a useful deterrent which residents can point to to hasten the departure of these individuals. These silver cylinders, which are about 10cm long, were traditionally used by dentists and surgeons to numb pain but are now used in household appliances like soda stream and whipped cream dispensers, making them readily available in various stores and online. It has become a craze at festivals, concerts and clubs. It works by blocking signals to the conscious mind from other parts of the brain, giving users a brief feeling of relaxation, intense euphoria and making them giggly. Possessing and inhaling this gas is legal, but supplying it to under-18s could lead to prosecution. Unlicensed vendors risk a two-year prison sentence. Driving under the influence of nitrous oxide could also lead to a heavy fine, disqualification from driving and even a prison sentence. The sale of these canisters to individuals is an offence and the police and the Council’s anti social behaviour team are monitoring the situation. It is also worth reporting canisters lying around to the Police on 101 who can trace where they have come from by their batch numbers. Laughing gas is now the fourth most used drug in the UK, according to the Global Drug Survey 2015. When the gas comes out of a canister it can be so cold it can burn. A cold shock at the back of the throat can affect the vagus nerve, causing the heart rate to suddenly slow. In the past year, only people in the Netherlands used it more. 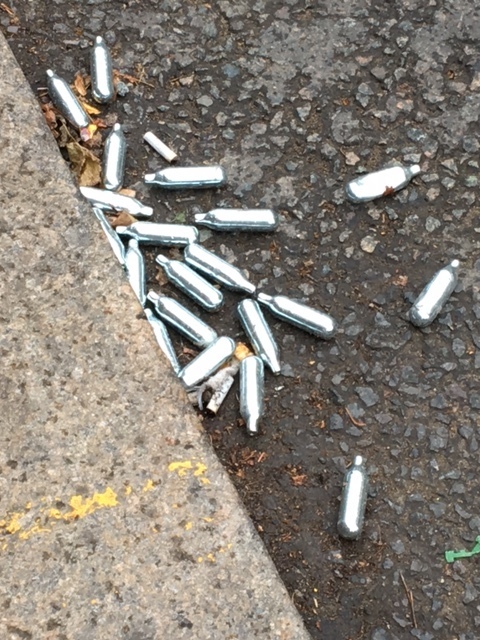 More than 3,500 canisters of nitrous oxide were seized by police at Notting Hill Carnival last year .